LOS ANGELES – April 19, 2016 – Action star Danny Trejo will headline the season finale of Rick Najera’s popular Latino Thought Makers entertainment series live on Wednesday, May 4, 2016 at 7:00pm at Oxnard College’s 400-seat state-of-the art Performing Arts Center in Oxnard, CA. The series, presented by Oxnard College Institute for Latino Performing Arts, is hosted by comedian and award-winning writer-director-author Rick Najera. Entrance to the event is free. Special guest Danny Trejo is undeniably one of the most recognized and influential Latinos in America who has developed a prolific career in the entertainment industry. Starting out with humble beginnings to landing lead roles in blockbuster films such as Machete, Desperado, Heat, From Dusk Till Dawn series, Con Air, Once Upon a Time in Mexico, Spy Kids, Grindhouse, Muppets Most Wanted, The Book of Life and more, Trejo’s name, face, and achievements are internationally recognized. In addition to films, he has also had a successful career in television with roles on NCIS: Los Angeles, Sons of Anarchy, King of the Hill, Bones, Modern Family, and Breaking Bad among others. His road to success has been hard-earned and is anything but typical. From imprisonment to helping young people battle drug addiction, he has risen to become a great actor and even greater person. Despite his impressive list of credits, it’s his continuous roles as a devoted father of three and an intervention counselor that bring him the most satisfaction. At the helm of the program, Rick Najera, an award-winning writer-director-comedian and thought maker himself, is surprised at how quickly the program has grown. “Above all, this series is entertaining and in this day and age of people wanting to build walls, this program instead builds bridges, bridges of understanding,” said Najera. 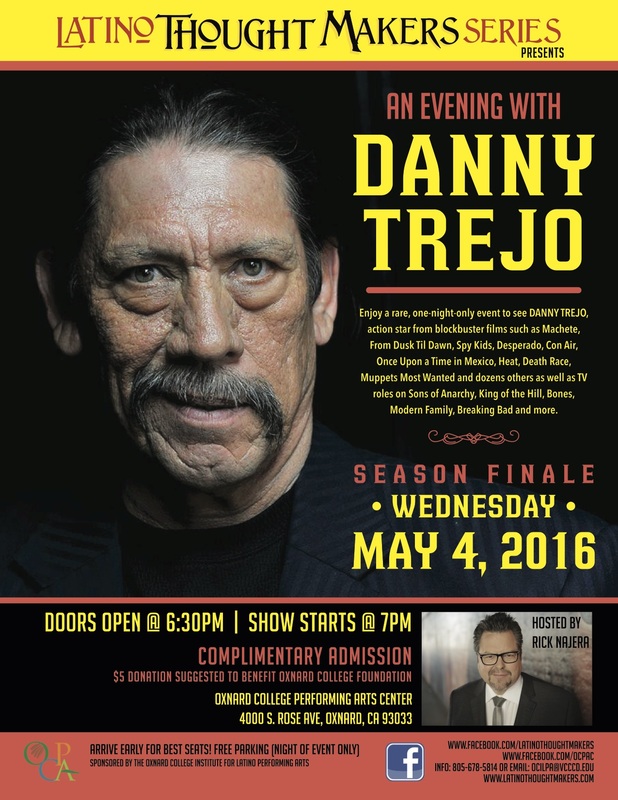 Oxnard College Institute for Latino Performing Arts presents the Latino Thought Makers Series hosted by Rick Najera with special guest Danny Trejo on Wednesday, May 4, 2016. Doors open at 6:30pm, show starts at 7pm at Oxnard College Performing Arts Center, 4000 S. Rose Ave, Oxnard, CA 93033. Guests are encouraged to arrive early. Entrance and parking are free. A $5 donation is suggested to benefit the Oxnard College Foundation supporting students in the arts. View a clip of Latino Thought Makers here. For more information on Latino Thought Makers, please visit: www.latinothoughtmakers.com or visit the Facebook invite HERE.